Over breakfast there was more talk of gear with Don and Jane. As I was packing up my gear there were a lot of questions about what I was carrying for such a long walk. Being the gear junkie that I am, I was more than happy to oblige. With a farewell photo we were off. The cloud rolled in early this morning, racing up the hills from the coast below. The views we were treated to yesterday had all but disappeared so off into the clouds we climbed. Straight away there was a steep climb up to a memorial beacon dedicated to a tramper who had perished here some time ago. The terrain continued to follow the ridge line, continually taking us uphills and down to small saddles before continuing the climb up. Taking out time we walked through more awesome beach forest, heavily covered in moss, ticking off the major points on the track including Gable Track junction, climbing Dora Ridge, Butcher Saddle and another track junction. All junctions were signed, pointing us in the right direction. 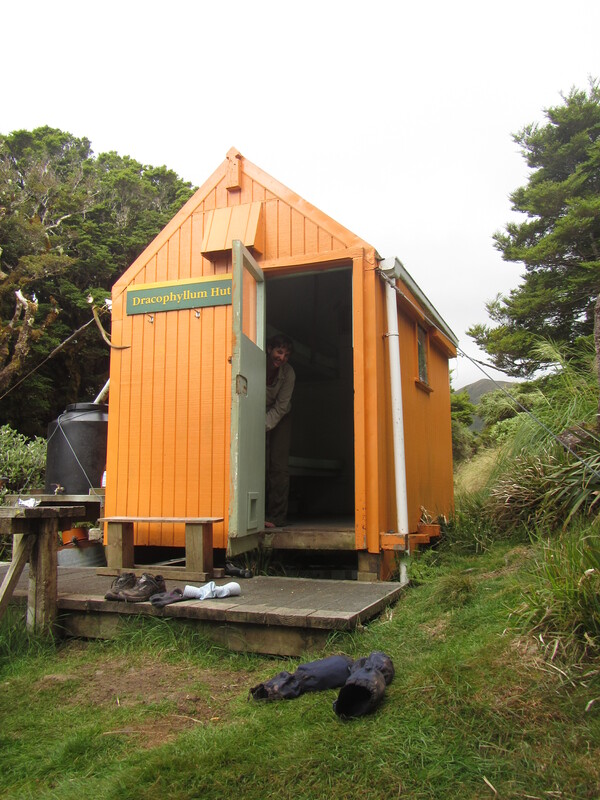 Just before noon we got to Te Matawai Hut and decided on an early lunch. The trail register was full of other TA trampers I knew who has passed through in previous days and quite a few who stayed here last night. From Te Matawai Hut we had a fair climb ahead, exiting the trees and climbing into the open alpine ridges, the highest point Pukematawai sitting at 1440 metres. Out of the trees the cloud started to clear and by the time we were half way up the ridge we had awesome views. The wind was out in force. We passed a couple travelling in the opposite direction and they informed us that our destination for the day was a very small hut with only two bunks. I had read this in the trail notes but it didn’t really click that two bunks equals exactly that, enough space for two people to stay. Sounded more like a bivouac that a hut. Hears hoping that no one else was there as there is generally not many good sites for tents up high; rain and wind were also forecast to increase overnight going into crazy conditions tomorrow. We hit the top of Pukematawai and had to shelter from the wind on the lee side. It was around maybe 30km/hr and bitterly cold. From the top we had clear views of the climb we had just completed and could see both Waiopehu Hut in the distance and the red roof of Te Matawai Hut down below. 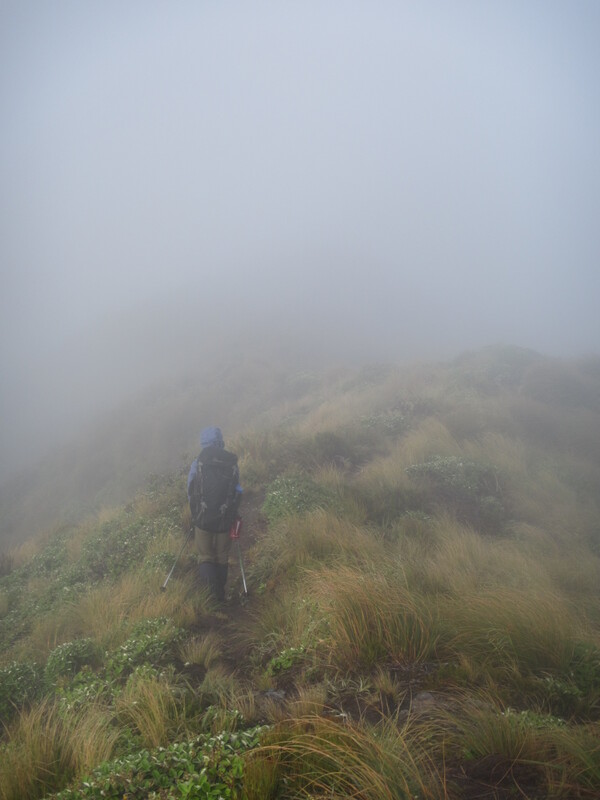 We also had a great view of the ridge we needed to follow for the next 4 kilometres, almost 3km to go above the tree line before getting back into the shelter of the trees and to Dracophyllum Hut. The afternoon was wearing on and we were very keen to reach the hut. More ups and downs and the kilometres seemed to drag on. Day two is always tough on any tramp and I think Sarah was starting to feel it in the legs. After what seemed like an age we reached the hut and yep, its tiny, one bed and a bunk overhead, not much room to move around. We didn’t care and were just glade to have got there. No one else around so it was all ours for the night. We were both knackered. And I’m thinking if I’m tired, how is poor Sarah feeling? I’m sure she was asking “What have I got myself into. Another 4 days of this? OMG.” She did great. Once sorted at the hut a bit and changing into warmer clothes all we could manage to do was cook up some dinner, jump in sleeping bags and read for a while before sleep quickly took hold. It was great meeting you and we picked up some terrific tips. Our Sawyer water filter is already on it’s way and I am way more confident about tackling India now. We can clearly upgrade some of our other outdoors gear too as we have a must do tramping list to tick off now we are retired. I am hankering after one of those tents that use walking poles. What a brillant concept is that! I am also going to construct an insulating billie warmer – great idea Mick! Our trip down was not a lot quicker than up with the mud and rough terrain. Harry dog was a bit knackered the next day but his feet were fine. How ca we send you the farewell photos Mick?